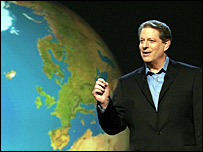 The government faces a legal challenge for sending every secondary school in England a copy of Al Gore's climate change film An Inconvenient Truth. The Department for Education and Skills confirmed on Thursday it had sent out a resource pack for science, geography and citizenship lessons. But a father from Kent, Stuart Dimmock, has lodged papers at London's High Court seeking judicial review. He is reportedly also seeking to prevent schools receiving the DVDs. The DfES said it would await the outcome of the court application with interest. Schools Minister Jim Knight said of the teaching pack: "Climate change is one of the most important challenges facing our planet today. "This pack will help to give young people information and inspiration to understand and debate the issues around climate change, and how they as individuals and members of a community should respond to it." Climate Change and Environment Minister Ian Pearson said: "There is a clear scientific consensus on the causes and impacts of climate change." The commitment and enthusiasm of young people would be essential to meeting this challenge, he said. "We must ensure that they have the tools and the information they need to make informed decisions about their lives and their communities, which this pack for secondary schools will help to provide." The film by the former US vice-president turned environmental campaigner has won two Oscars.